Forest Hill provides the most comprehensive selection of floor plans for our apartments and cottages. If you are searching for a California independent living or assisted living community you will find that our CCRC is an amazing option with flexible living options. Forest Hill retirement community is unique in the variety of living options that are available including economical studios, one-bedrooms, two-bedrooms, and two-bedroom-plus-den floor plans. At Forest Hill, you can select the floor plan that best suits your needs as well as the location you prefer including apartments on the top floors with spectacular panoramic Monterey Bay and coastline views. Set in Pacific Grove on the scenic Monterey Peninsula, Forest Hill is a full-service retirement community truly like no other. At the heart of our community of apartments and cottages is our elegant Main Building, originally a historic hotel built during the roaring 1920s. Only Forest Hill provides the most comprehensive selection of floor plans, contract options, and health care services to ensure greater control over your future. You may prefer an apartment or cottage from studios to two bedrooms with two bathrooms. Or, perhaps you may choose an apartment in the five-story Historic Building with remarkable character, high ceilings and an abundance of natural light. 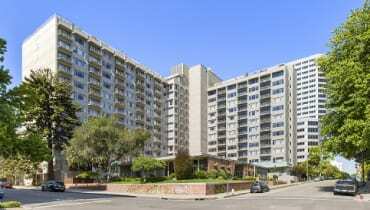 Many apartments on the top floors feature spectacular, panoramic views of Monterey Bay. We are happy to help you choose the option that suits your lifestyle, and you are welcome to bring your pets, too. Along with multiple floor plan options, all of the programs and amenities available at Forest Hill, you’ll have the assurance of a continuum of care, if you should ever need it. Our senior living community offers multiple floor plan options available to fit your senior retirement needs. And to explore the full scope of the continuum of care available at Forest Hill, we recommend you visit the pages devoted to independent living, assisted living and skilled nursing.